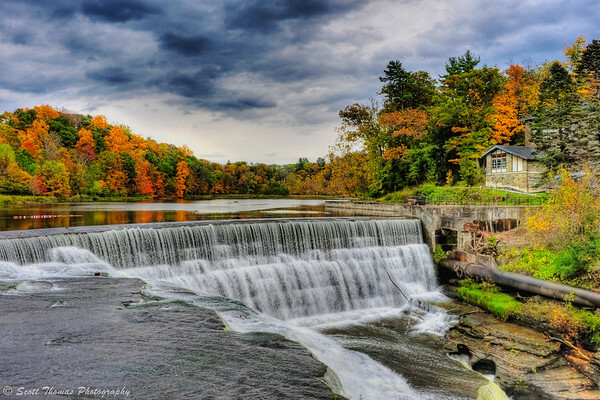 Beebe Lake on the Cornell University campus in Ithaca, New York, was created back in 1828 to harness the hydro-power of Fall Creek. In 1898, the dam was raised another ten feet to bring the lake to the size it is today. Like most colleges and universities in America, Cornell is located on the valley hills surrounding Cayuga Lake overlooking the city of Ithaca on land which could not be easily farmed. NOTE: I know a lot of people from a message board post about Cornell are visiting this article. Just wanted to extend a warm welcome to you all. The campus and the surrounding parks are amazingly beautiful. Almost like the area is out of Middle Earth. Click Here for more photos I have taken of Ithaca and shared here on Views Infinitum. Beebe Dam on the Cornell University campus in Ithaca, New York. Nikon D700/38-300VR, f/16, ISO 1100, EV +0.3, 28mm focal length, HDR. During my visit two weeks ago, I had the pleasure of being guided by Ithaca bloggers Barbara of The Aspiring Photographer and Debbie of My Life in CNY. Both have lots of knowledge of Cornell. The nature trail they took me to had some of the best fall foliage I had seen this year. 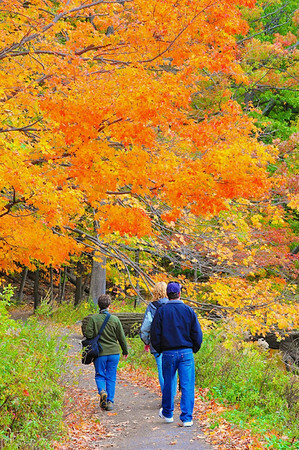 Barbara (on the left) and Debbie (on the right) with her husband following on the Beebe Lake nature trail at Cornell University in Ithaca, New York. Nikon D700/28-300VR, 1/100s, f/16, ISO 3200, EV +0.3, 98mm focal length. The nature trail takes you to an old stone bridge over Fall Creek as it flows into Beebe Lake. The trail’s return leg back to Cornell’s main campus had views of the lake with colorful trees reflected in the water. Even the clouds had thinned a bit to show some blue in the sky. Colorful fall foliage reflected in Beebe Lake at Cornell University in Ithaca, New York. Nikon D700/Tokina 11-16mm, 1/100s, f/16, ISO 3200, EV 0, 15mm focal length. With November historically being a cold, gray, wet month, I’ll be taking the time to catch up on all the photography I have done the last two months I have not had time to share with all of you. NOTE: With the U.S. Holiday of Thanksgiving being early this year, I will be announcing the next photo assignment this Wednesday. 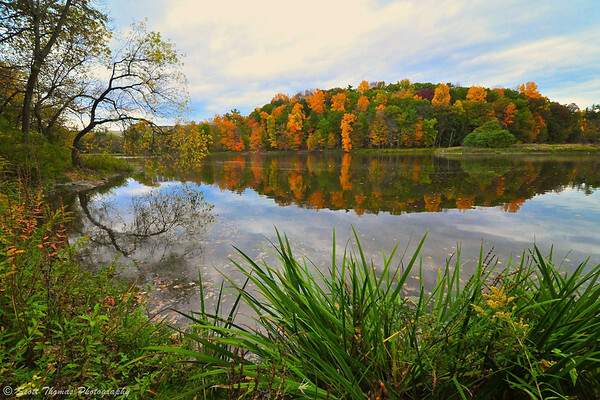 This entry was posted in Nature, Weekly View and tagged 28-300mm, autumn, beebe lake, campus, colors, cornell university, dam, fall foliage, hdr, ithaca, nature trail, new york, nikon D700, reflection, tokina 11-16mm, trees, uwa, vr, water, waterfall, wide angle. Bookmark the permalink. Old college campuses are a mix of old and new architecture. Cornell is no different yet they have kept this natural area for the students to enjoy. It was a very quiet and restful place. Those colours are wonderful, and of course, you have captured everything beautifully. The waterfall shot is magical. Thanks, Sybil! The colors are a blessing from Nature. The magic of the waterfall from the HDR processing. Stunning foliage, Scott and you captured it beautifully. Can’t really go wrong wtih still water reflections, huh? How fun that you had familiar guides to show you around! Nope. This area is very protected as on top of the hills, it was breezy. Barbara and Debbie were of great help. Without them I would have wandered around and not known what I was photographing. What a gorgeous place! Were I of college age, I would consider Cornell just for the beauty of the place! I almost went here but opted for a different path. It sure was hard not to go here just for it’s beauty. I lived for half a year a bit north of Cornell, in Union Springs, and I still fondly remember how scenic that area is. But, as beautiful as the snow can be there, I don’t miss the cold at all, which is why I’ve been in Texas for 35 years now. I sure hope you get some much needed rain in Austin, Steve! Boyohboy did I have a good time on my virtual walk with you and the Ithaca bloggers. That is an exceptionally beautiful place. I am a fool for waterfalls, so I was always going to love that shot, wasn’t I–but I have to admit the curving shape of the reflected trees plays very well against the sharp blades in the foreground. Nice ones, Scott. Thanks you, Gerry! The walk was easy and flat. You and your companions would have enjoyed it very much. One of my friends attended college there and I never knew that it is this beautiful. I love the first HDR shot, looks almost like a painting. I am surprised and impressed that a university has such fantastic natural surroundings. A dream place to photograph, and especially the last photo is amazing and beautiful.